Overall, it was a fantastic event, and, I believe, a model for others to emulate. The mix of speakers and historians, the living historians and re-enactors, and various other groups, all came together to produce a great event. We arrived on Saturday morning and got checked in, and began to scope out the area. Having been to the Ft. Fisher State Historic site on several occasions, I was familiar with the area. Talks started at 10:00 am, and I had a chance to sit in on the portions of the lectures delivered by several, including Rod Gragg and Chris Fonvielle. Pat McCory, Governor of North Carolina, spoke at the monument at Battlefield Acre shortly after 11:00 am on Saturday, followed by Ed Bearss. The battle portion of the reenactment started at 1:00 pm on Saturday with a shot from the Fort's 32-pounder. Saturday evening concluded with a lantern tour. Estimated visitor count on Saturday was placed at 12,500 folks. Late Saturday night and into early Sunday morning, the rains blew through the area. Despite the sogginess, there were still throngs of visitors at the site. The reenactment scheduled to begin at 10:00 am was pushed back to 12:00. I spoke again at 1:30, and about 3:30, we started back toward the mountains. 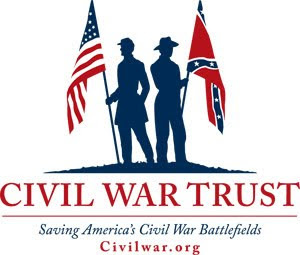 As I mentioned before, it was good to see the reenactors and sutlers, the living history displays, listen to the lectures, and visit with the Friends of Ft. Fisher and the various Sons of Confederate Veterans camps set up. Kudos to the George Davis Camp, SCV. They had brought their notes and records, along with their North Carolina Troop books, and were helping people look up their Confederate ancestors. There was also a reunion during the weekend for people whose ancestors had originally served on the Confederate or Union side during the war at Ft. Fisher. Overall, it was a fantastic event. There are many other events coming up in the next three months, including reenactments in Wilmington and at Ft. Fisher, Averasboro, Bentonville, and the Bennett Place. I know I will be at Averasboro and the Bennett Place. I look forward to seeing you out and about. Many of you know I don't make trips off the mountain much in the winter time. The weather is unpredictable, and the months of December, January, February, and March are my writing time. 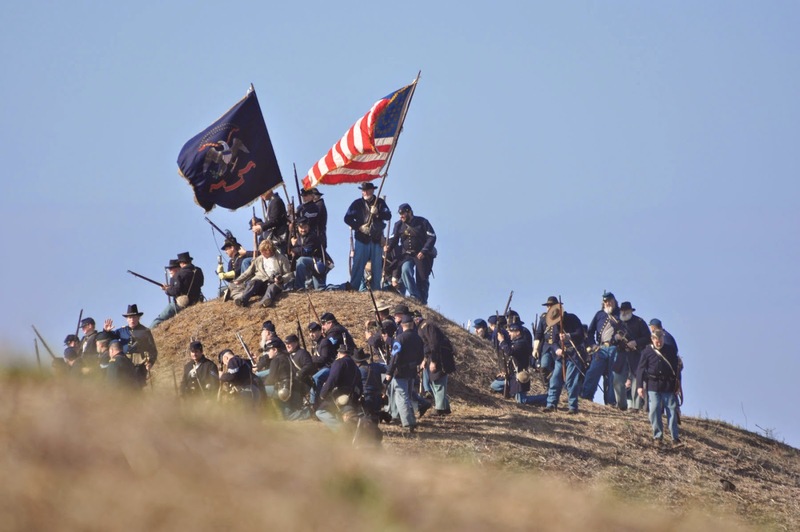 I'm making an exception this weekend and heading to the 150th commemoration of the fall of Fort Fisher. The Friends of Fort Fisher and the staff at the Fort Fisher State Historic Site have put together a superb event. If you are in the area, I hope you will join me! There will be a slew of things to do. Opening ceremonies kick off at Battle Acre at 11:00 pm. Ed Bearss is scheduled to speak, as is Gov. Pat. McCrory. 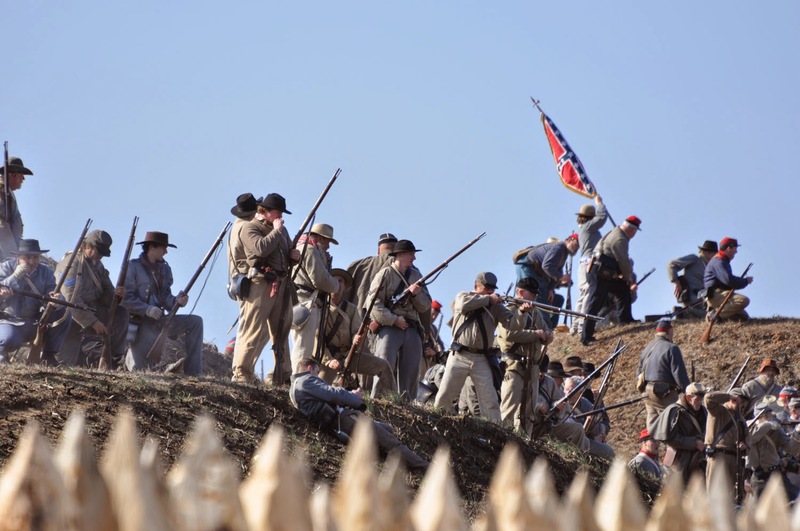 There are living history demonstrations throughout the day in different areas, and a re-enactment of the assault on Shepherd's Battery at 1:30 on Saturday and at 10:00 on Sunday. A speakers' tent will hold lectures by Rod Gragg, Chris Fonvielle, Richard Triebe, Ray Flowers, and Michael C. Hardy (hey, that's me!). A host of other activities, including a candlelight tour Saturday evening. 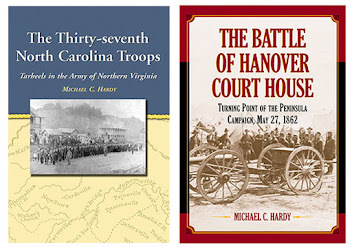 This event kicks off the final years of the sesquicentennial events, a year in which the war really comes home to North Carolina. I look forward to seeing many of you out and about at these events. The picture? 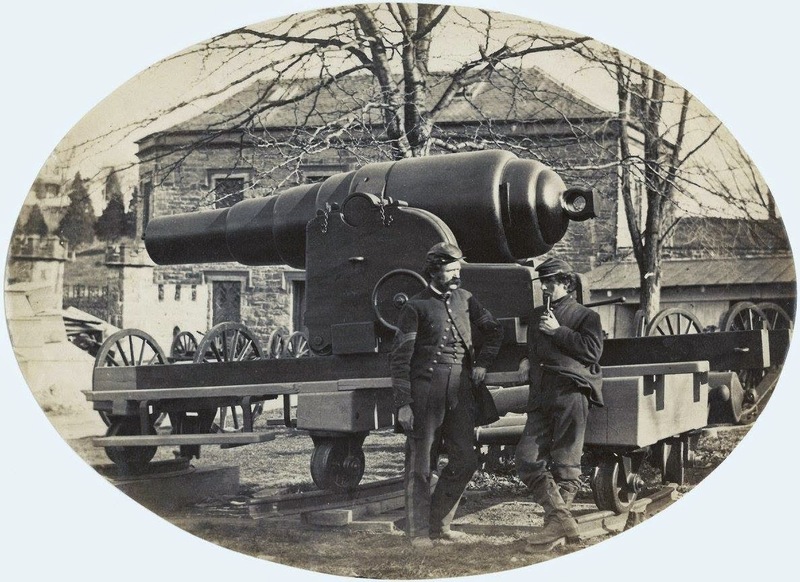 This is the Armstrong Gun captured at Fort Fisher, on display at West Point after the war. As part of the Conscription Act of April 1862, regiments that re-enlisted for the war were allowed to re-elect their commanding officers. Most regiments replaced a handful of officers. The 18th Regiment, replaced almost everyone. You might think I exaggerate, but I do not. 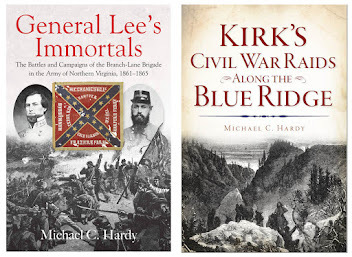 The colonel, lieutenant colonel, and adjutant were defeated for re-election, while the assistant commissary of substance chose to resign on the day of the election (April 24, 1862). Seven of the ten company captains were replaced and in some companies, all the officers lost their bids for re-election. My question, however, is this: how did the adjutant, which is an appointed position, lose his position through an election? Well, I believe this one mystery is solved. Only a million or so more to go now... Thoughts? What happened to George Trenholm? Anytime you are researching and have more than one source, you run into the possibility of the sources not agreeing. Such is the case of the journey of Confederate Secretary of the Treasury George Trenholm and the last days of the Confederate government. 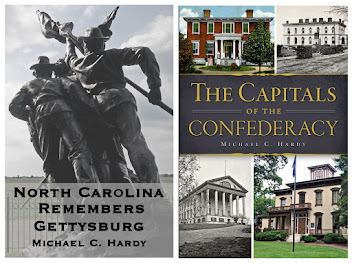 There are four places that claim to have hosted the last meeting of the Confederate cabinet: Charlotte, NC; Fort Mill and Abbeville, SC; and, Washington, Georgia. 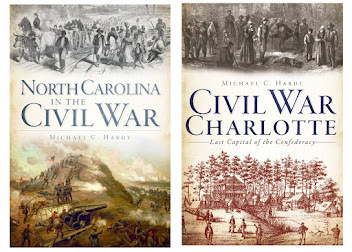 My argument has always been that the last meeting of the Confederate cabinet was in Charlotte on April 26, 1865. After that morning meeting in the Phifer home, the government more or less broke up for all practical intents and purposes. Who was present at that meeting? George Davis was the first to leave. On April 25, Jefferson Davis advised George Davis (no relation) to look after his family. George Davis submitted his resignation, and it was accepted the following day. I do not believe that George Davis crossed into South Carolina with Jefferson Davis's party. George Trenholm - The Secretary of the Treasury was sick, and had been sick on the entire trip, from Richmond to Danville to Greensboro, and eventually to Charlotte. He was so ill that the other members of the Confederate cabinet gathered in his room on the morning of April 26 before setting out. 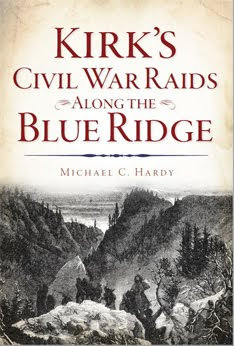 Mrs. Trenholm, who was a member of the party, wrote afterwards: "We started again in the ambulance on the 26th & reached Mr. White's, three miles from the Catawba Bridge (Fort Mills) the same day. Here Mr. Trenholm was so sick we had to stop a day. The President & Cabinet proceeded on their journey. Mr. Trenholm had a consultation with them and decided that he was unable to go on with them and attend to the duties of his office so he there handed in his resignation." I believe Mrs. Trenholm's account was written after the events transpired. An interesting, conflicting account is that of John T. Wood, one of Davis's staff officers. His diary seems to be a day off. 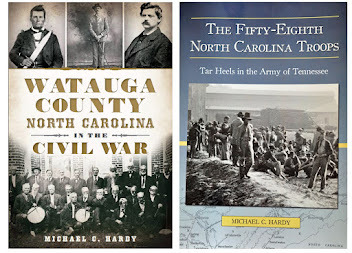 He chronicles that George Davis resigned on April 24, that the party crossed the South Carolina line on April 25, the same day that Trenholm resigned. y absence; and after consultation, the President sent for me and requested me to accept the appointment as Secretary of the Treasury..."
Jefferson Davis himself, writing in Rise and Fall of Confederate Government, states, "I rode out of Charlotte attended by the members of my Cabinet (except General Davis, who had gone to see his family residing in that section, and the Secretary of the Treasury, Mr. Trenholm, who was too ill to accompany me), my personal staff and cavalry, representing six brigades, numbering about 2,000." In a letter written in 1919, a Phifer descendant stated that the Trenholms remained in Charlotte several days before traveling to Fort Mill and to Winnsboro before turning toward home. 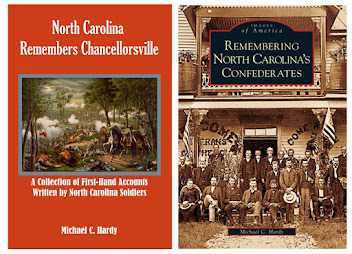 There are many who claim that Fort Mill, South Carolina, was the site of the last meeting of the full Confederate cabinet. Reagan admits he was not there. 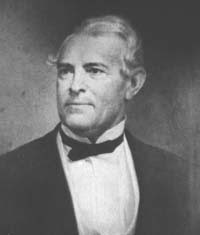 George Davis had already resigned, and it would appear that Trenholm was not with the group, at least according to Jefferson Davis. That leaves three members : Mallory, Benjamin, and Breckenridge, hardly the full Confederate cabinet.